Small World, a community art event created by UBC sculpture professor Samuel Roy-Bois, invites the community to participate in the creation of a three-dimensional structure that represents the interconnections of humans and nature. Small World takes place Saturday, July 4, at the Brent’s Grist Mill Heritage site at the bottom of Dilworth Mountain along Mill Creek Linear Park in Kelowna. This event is free, family-friendly, and open to the public. Drop in at any time during the day to participate. Using two popular catch-phrases “it’s a small world” and “six degrees of separation,” artists at UBC’s Okanagan campus are inviting people to participate in this public art project. Small World is a community art event created by Samuel Roy-Bois, sculpture professor with UBC Okanagan’s Faculty of Creative and Critical Studies (FCCS). The project’s name refers to Stanley Milgram’s experiment demonstrating the six-degrees of separation between people. 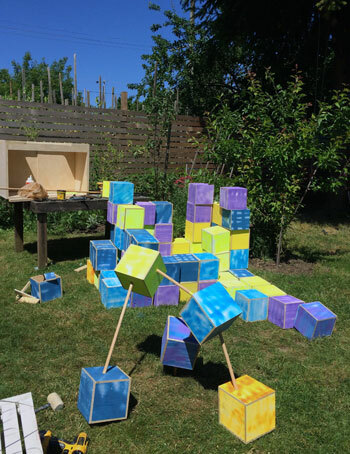 It is an invitation to create a large three-dimensional representation of human and nature interconnections, says Roy-Bois. Small world is also a celebration of the collective effort and the pleasure of fabricating. All materials, components and tools will be provided on site. The event is the second installment of Bee Central: A Community Art Pollinator Project, part of the UBC Okanagan Eco Art Incubator. Bee Central is part of a larger plan to introduce and stimulate a ‘buzz’ about bees and the Brent’s Grist Mill Heritage Park, particularly to attract a diverse community to help with the planting, building and maintaining of a Public Art Pollinator Pasture in Kelowna. Bee Central is partly made possible by a Community Public Art Grant from the City of Kelowna.